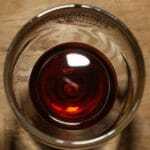 From what I’ve seen, Lambic mead is not made particularly often. 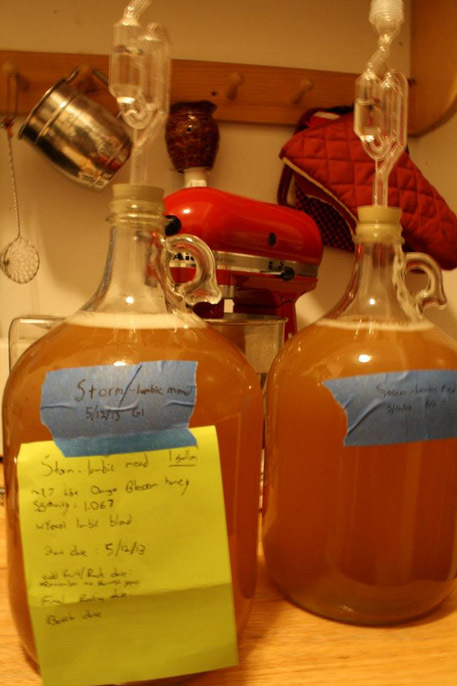 I have found this to be either from: wanting to do one but not enough info is found on others who have done one (a sour mead) –OR– People aren’t ready to take the step into purposely infecting their batch and equipment with bacteria that runs the risk of infecting other batches. Not much! 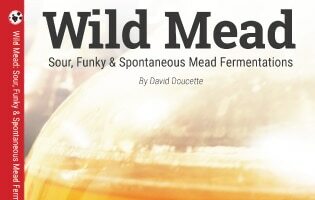 Nothing beyond what you can read on the rest of the Internet about sours and sour meads. This is my first experiment into sour meads and sour anything in general. This article will take at least a year to finish, but it will finish at some point. 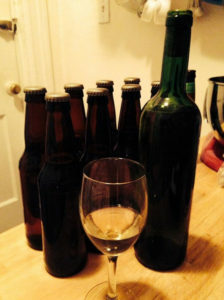 If the article suddenly stops, it is because you are reading the most up to date info on this batch of Lambic mead; and the rest will come eventually. I will update as necessary. To begin, sanitize all your equipment. Although I am inoculating the must with “wild” bugs and bacteria; I still want to control that wild things may enter. I made two gallons of this in the same brewing session to utilize the yeast as best possible in my situation. Since I used a no-heat method, I pitched the liquid starter from the smack-pack right after preparing the musts. 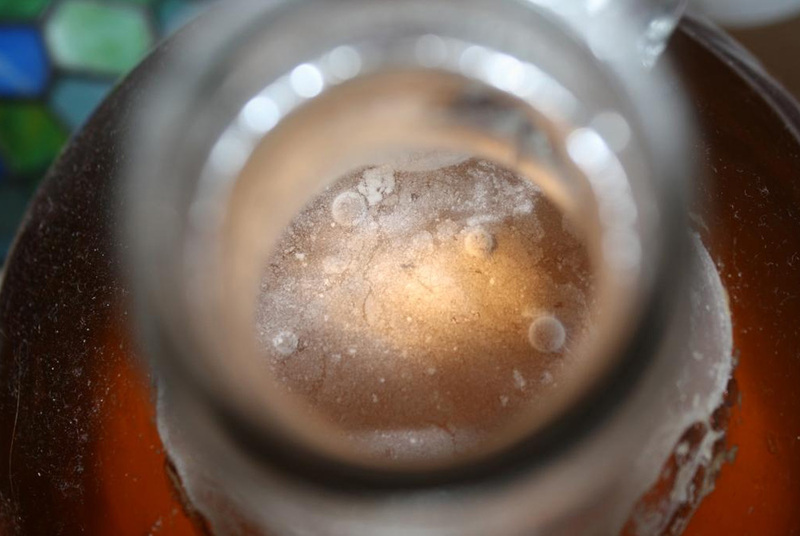 There are no signs of active fermentation; However there is what seems to be the beginnings of pellicle formation. There is what looks like a thing layer of “dust” settled on the top of the must. This is obviously not dust; I have an airlock on it! There is also a very small white nugget with a tiny arm or two near the center of both carboys. I am not able to capture any of this on my camera as of yet. They are so fine the camera can’t focus on it. Yeast are finally waking up and the bacteria seem to have not taken their time in getting a foothold in the fermenter. And to think my smack pack would be in trouble being 8 months past manufacture date. 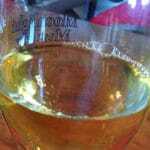 The Yeast have started to taken over, and fermentation is proceeding at a rate about equivalent to a standard mead. I’ll be adding some maltodextrin soon to add food for the bacteria cultures that yeast cannot get to. I’ve added 1/4 pound Maltodextrin to each gallon. Be sure to dissolve it completely before adding to your must. Gravity has dropped to 1.030 and dropping. I’ve also not been aerating as I would with a standard mead. The bacteria I pitched does not like oxygen. A pellicle is actually a defense mechanism to block oxygen, so adding it may be counter-productive to the souring process. I also added 3 medium toast oak chips to each gallon, this amount of oak should be low enough to not worry about over-oaking, as they will sit in there for a long duration, and create a sort of home base for the bacteria. This was suggested to me by some sour pros on homebrew talk. At around 29 days or so, I could see that things were really starting to kick into gear while the sachh yeast is pulling away. Now we have the beginnings of a pellicle. It is photo 3 to the left. The lower bubble has doubled in size overnight. I’m getting pretty excited about this batch now. The mead is actually a lighter color than pictured, because the carboys are sitting in a dark closet. The color is closer to a light gold at this point. the first pellicle has risen and fallen. But a new one is starting to take form. It is a bit more plate-like than the previous more bubbly one. I have taken a small taste from one of the gallons. It has a lighter taste akin to most hydromels. However there is a building complexity from the bacteria. A mild sourness greets the palate but it should (and I hope it does) increase sourness as the next few months pass by. I also pitched the dregs of Boulevard’s 2013 Saison Brett into each carboy. One of the gallons has a mild pellicle, the other doesn’t. I’m not concerned. I’m still hesitant to bother with gravity readings since I don’t want to infect my only hydrometer. It is however, about time to rack onto some new foods for the bugs, and off that mass of sludge (per advice on Mad Fermentationist to rack as normal until off sediment / trub (no trub in mead, so I usually go close to 3-4 months before first racking)). Both of them are pretty clear to this point. One of the Gallons will be aged on some bourbon soaked light oak chips. And the other is going to get strawberries.. Both of the gallons got racked. One gallon got a good 2-2.5 pounds of strawberries. And as promised the other one got light bourbon soaked oak chips. The strawberry one has been giving me issues. The yeast / bugs / whatever got really excited about the strawberries and i got Strawberry Lambic mead all over the closet. I had napkins down which was good. Who ever moves into my apartment next should have no trouble making anything with house yeast which is probably well cultured in my kitchen as well as my bedroom closet. The oak chips gallon has full pellicle coverage, bubbles film and all (pictures coming soon)…It’s pretty exciting that this project is nearing the half-way point. I have plans to bottle the oaked gallon at my wedding. From there (if it tastes good) I will begin a third gallon “G3” and bottle the strawberry one at 1.5 years (Starting “G4” at that point) so I have a 6 month rotation of finished Lambic Meads. I’ll Ride this generation of yeast/ bugs for at least a few cycles and monitor the changes. Nothing too new. 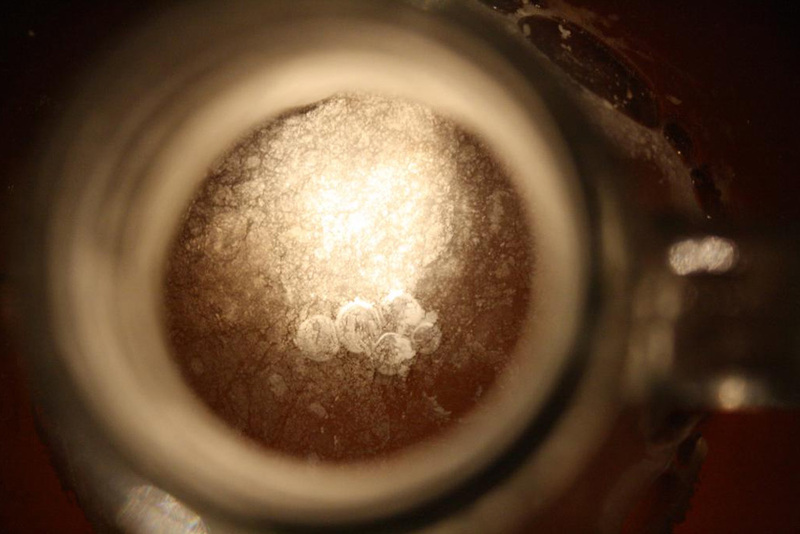 The pellicle on the oaked one is growing into something recognizable as a full pellicle. The strawberry one still has a large cap of strawberries, slowly decaying from the alcohol content. Here’s a picture to go with it. Adding new pellicle photos. Put me down for 2000 words because I got 2 more pictures. Also, blogger doesn’t recognize pellicle as a word. Somebody better call them. Tasting Updates! Took tastes of both the strawberry and traditional lambic meads. The traditional is definitely more where I want it to be than the strawberry. I may end up pitching a whole thing of cherries into it for kicks, since I plan on aging it another 6 months anyways. The traditional with bourbon light oak chips has a really good balance with a bit of funk, good body, and a really good hit of sour. I’m happy I’ll be able to share it with my friends the day before my wedding, or day of, or both). I’m pretty pleased with the results thus far and I think I can see we will go for a generation 2 Lambic mead in the near future. The next update will probably be at bottling time! Can you believe it? Bottled! Since this had been topped up I ended up getting eight 12 oz bottles as well as one 750ml wine bottle. There was a bit left in a 9th bottle that I poured into a glass and capped the other 1/3 of a bottle to bring to work for a few friends. I also pitched a new second generation lambic mead onto the cake (with some saved slurry too). I’ll make a new posting to follow for that generation. One final picture for you guys! Happy Meading. Feel free to ask me any questions! ADDENDUM: Strawberry Lambic Mead Continued.